After material injected by nozzle, runner systems will convey the molten material from the sprue to the gate. 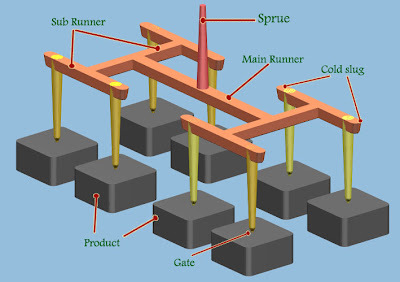 basic runner system consist of sprue, main runner, sub runner, cold slug, and gate. since the design of the runner system has large effect on molding quality, molding efficiency, cycle time, cooling time and other factor, it is important key when design of mold. sprue will contact first time with melt plastic, at the injection process, sprue always contact with nozzle from the injection machine, so consider when design the sprue consider the ball radius of nozzle, make sure it isn't make undercut on sprue.The dimensions of the sprue depend primarily on the dimensions of the molded part in particular the wall thickness, too little sprue will make sprue cold faster and make insufficient flow. First time when design runner system, determine number of cavities, shape and gate types, then arrange the cavity layout,at the multi cavity of mold balancing of runner is important, balancing ensures virtually equal flow of plastic trough each gate. this part will continues flow from main runner until the gate, the dimension of sub runner and how much sub runner system will be, is very depending on how much cavity of the mold, and how the layout, what the layout use herring bone, H type, or star type. at the picture above use H type runner layout. when runner layout bent, clod slug may be required to continue plastic flow of better quality to the cavities.The cold slug well helps the flow of material through the runner system by stopping colder, higher viscosity material moving at the forefront of the molten mass entering into the cavity.The length of the well is usually equal to or greater about 1,5-2 time than the runner diameter. Basic purpose of the gate is to limit the flow of the melted plastic, but it must allow that melted plastic flow and fill the cavity easily. considering the fluidity of the material, gate should be made near the center of gravity of molding or the line to make flow uniform and melted material even, then make the gate thick but still considering melted plastic material, becouse thin part will cooled easily and faster. The runner should be large enough to minimize pressure loss, yet small enough to maintain satisfactory cycle time, Large runners are not economical because of the amount of energy that goes into forming, and then regrinding the material that solidifies within them. look at picture below shown standard runner and H bridge type runner. Balancing the runner system ensures that all mold cavities fill at the same rate and pressure, if the product have not similar product geometry, it is recommended to use mold analysis software like mold flow or C-Mold. I want to know practical proven runner & gate calculation which very important while doing mould design. I read your post and I really appreciate your experience. I will get good knowledge from there as well. I read your post and I really appreciate your experience. Please can u help me with various plastic welding technique basic and how to select one on the basis of efficiency and cost. I am so happy to see this blog successful amongst people, the quality information and the way of explaining is totally perfect. The information which you have provided is very good. It is very useful who is looking for HDPE Bottles Manufacturer.